Five Magics is an unpublished (maybe unfinished) game that Richard Garfield started creating in 1982. It was inspired by Richard's experience with the game Cosmic Encounter, and based on the premise that each card could break the rules of the game. Safecracker is an unpublished (maybe unfinished) game that Richard Garfield started creating in 1985. It is a card game where each player would build a safe, and then play cards to try and crack (open) their opponents safe. This was the first concept that Richard tried to apply to the trading card game concept that he had pitched to Peter in August 1991. It was changed to have a dungeon theme, to become Dungeon Cracker. He then inserted the Five Magics environment, and went from there to eventually create the prototype known as Magic Alpha Playtest. Information is difficult to find and pictures are not currently available. 120 cards, hand drawn by Richard on yellow cardstock. The only duplicate cards in the deck were basic lands and a pair of (Drudge) Skeletons. (I'm guessing about 1/3 land, so about 80 other cards) All other cards only had a single copy. This single set of 120 cards would be shuffled and split in half to provide a deck for each player. Mana cost was written as the total converted mana cost, followed by how much of that cost was required to be a particular color. If a player lost (destroyed, stolen, etc.) all copies of a basic land type, all their permanents of that color were immediately destroyed. Walls could attack like any other creature. "Wall" was just part of the card name, and didn't carry any rules baggage yet. Power & Toughness were not yet separate concepts. A single number was used for both functions. Flying was the first creature ability. There were cards that allowed you to take cards from your opponent and not return them. You might gain/lose more cards in this way than you would from ante. Games were played for ante repeatedly, until one of the two decks couldn't be played anymore. In this way, it was similar to the card game "War". There was no deck size requirement yet, so you could still play if your deck was reduced to less than 40 cards. Richard tried it out with several people before moving on to Beta playtesting. Richard still had the complete set of 120 cards during an interview in 1994, and last time I spoke with him, he told me that he believed he still had it in storage. Beta playtesting involved 20+ people, who were each provided with a 60 card deck. Because so many copies were needed, the cards were created on a computer rather than hand draw all of them. However, Beta playtesting ran for almost a year. There are 6 different colors of cardstock (white, yellow, light orange, aqua green, blue, light blue), and this may indicate different print runs. I'm still researching this topic. Except for Artifacts, Beta playtest cards (including lands) have a circle which can be appropriately colored at the top right of the card. Beta playtest Artifacts have an "A" in the casting cost instead of a colored circle. Beta playtest Artifacts have their activation cost at the bottom right corner of the card. Creatures that have power equal to their toughness use a single digit format "X", while creatures that have power unequal to their toughness use a format to show both numbers "X/X". This seems to be true even on cards of the same color (print run), though I'm still looking into this to see at what point all cards adopted the "X/X" format. Some Beta playtest cards have a thick colored cardstock back attached to them. Red, white, blue, & black have been found so far, and it appears to be made from the cover of spiral bound notebooks. Skaff Elias said that the color was different for each playtest location. All other Beta playtest cards have a blank back. Losing all copies of a basic land type no longer caused permanents to be destroyed. Walls could no longer attack. There were still cards that permanently changed ownership of other cards. Games were still played for ante, though playing repeatedly was not a requirement. There was still no deck size requirement. Many "hoser" cards were added to encourage deck variety, and discourage powerful narrow strategies. Gamma playtesting roughly doubled the number of playtesters, adding a group with Strat-o-matic Baseball experience and trying different play formats such as league play. Gamma playtest cards are all on grey cardstock. Gamma playtest Artifacts do not have an "A" in the casting cost, but their activation cost is relocated to the top right of the card after the casting cost. 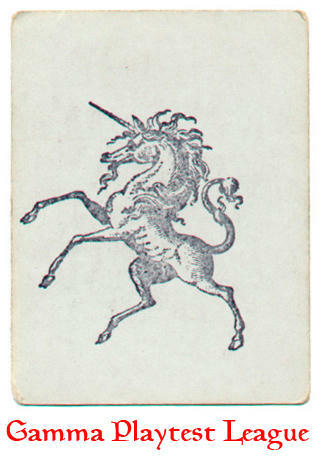 The Gamma playtest cards used in the league have a unicorn stamp on the back side. 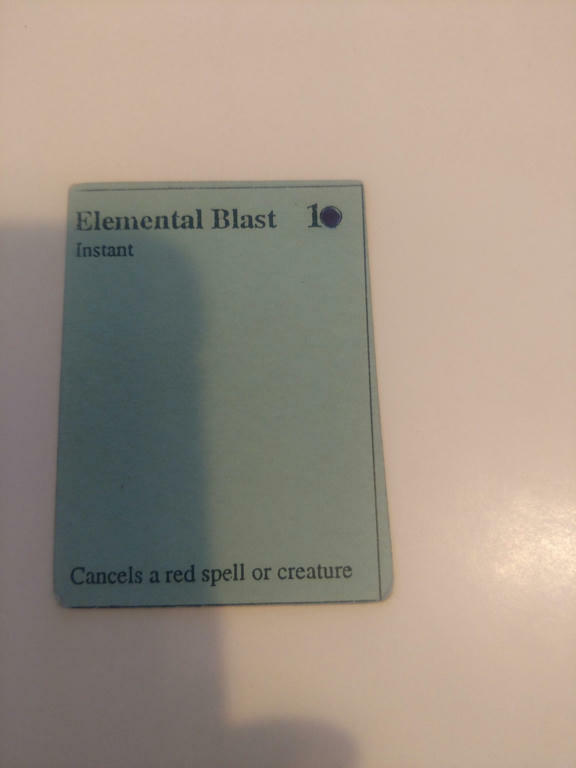 All other Gamma playtest cards have a blank back. Many adjustments were made to casting costs and rarity. Deck variety was further encouraged by emphasizing the strength and weakness of each single color. Cards that permanently changed ownership of other cards were removed, made temporary, or made rare. Someone built an 8 card deck that was designed to win on turn one, which caused the creation of the 40 card deck size requirement. It was discovered that "Magic" was to generic of a name to trademark, so the names Manaclash, Mana Clash, & Mana Flash (March 1st 1993) were all tried, but no one liked them. They'd been calling the game "Magic" all through playtesting. The solution was to subtitle the game, like White Wolf was doing with their games. Magic: The Gathering was trademarked and became the name of the game. In the fall of 1992, Richard had provided some Gamma decks to Peter Adkison. Steve Conard was a long time roleplaying friend of Peter's, and one of the five founding members of Wizards of the Coast, but a few months afterward, he married and moved away to Canada. Steve still did some freelance work for Wizards of the Coast, and occasionally visited his friends at the company headquarters in Peter's basement. Steve brought his friend Robin Herbert with him for a weekend visit to WotC in the fall of 1992. They spent a lot of the time playing Magic, and when they went home, Peter sent a playtest deck with each of them so they could continue playing. 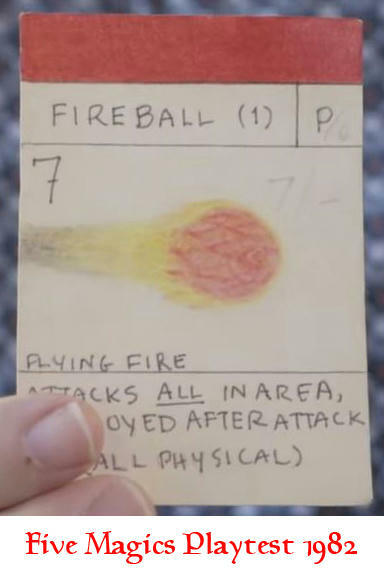 Before long, Steve and Robin had started creating their own cards based on the Gamma rules as they remembered them. They were far less familiar with the game than Richard's playtesters, resulting in raw unfocused card ideas. Peter sent them additional cards, which they copied along with making some cards of their own, and soon people were playing all over the software company they worked at. During Gamma playtesting, some playtesters had a different vision for what the card mix, rarity, and power levels should be like. They began creating their own card sets and playtesting those new sets. The problem with an ever expanding game is that each new release of cards is a smaller percent of the total card pool, making each new release less and less relevant to the overall game. Eventually, new releases wouldn't have enough affect on the game to justify their purchase price, which is a bad business model. There are two possible solutions for this. 1. Power Creep. If new releases contain more powerful cards, they will have a big effect on the game and people will buy them. Power creep isn't a great long term solution because it eventually breaks the game. 2. Rotate Cards Out. Changing the card pool alters the game environment, allowing new cards to take center stage without old cards getting in the way. Richard chose number 2. The plan for achieving this was to sell a Magic game for one year, and then release a new Magic game with a different card mix every year. Expecting that he would need more Magic games in the future, Richard allowed the playtesters to move forward with their custom card sets. Here is a picture taken in 1992, when Peter, Jesper Myrfors (the WotC Art Director), Lisa Stevens, & Vic Wertz (both with jobs too numerous to list) visited Richard and the playtesters in Pennsylvania. Notice the chalkboard in the background shows the names of potential future Magic sets. Magic: The Gathering Ice Age was created by Skaff Elias, Jim Lin, Chris Page, & Dave Pettey. They were friends of Richard's from the University of Pennsylvania math department, and had been playtesting Magic with him. They became known as "The Philladelphia Group" locally, and later as "The East Coast Playtesters". Early Ice Age playtest cards exist in Grey & Blue, and they have blank card backs. Ice Age had an illusion theme. The idea was that illusions could be played, but they would eventually fade away into nothing. This was accomplished through the game mechanic of Illusiory Upkeep, which was eventually printed as Cumulative Upkeep. Since it was intended to eventually replace Magic: The Gathering as the next Magic card game, it included many of the same common cards that Magic: The Gathering was built around. Magic: Menagerie was created by Bill Rose, Charlie Catino, Joel Mick, Howard Kahlenberg, Don Felice, & Elliot Segal, who had been playtesting Magic with Richard as "The Penn Group". The were friends of Richard's from the local Bridge club. Menagerie started as primarily a copy of Gamma with changes the Menagerie designers wanted to see made to the cards, plus some new card ideas of their own. Menagerie started as what the designers thought the game should be, because the game was still in playtesting and hadn't been finalized yet. Menagerie was designed with a limited format in mind. It was often drafted or played as sealed deck. The first Menagerie playtest cards are Orange and strongly resemble Gamma cards, but with occasional changes. As Menagerie evolved into its own set separate from Magic: The Gathering, it gained Flanking and Phasing. Menagerie has two sets of Pink playtest cards. One set has blank card backs, and the other set has magic: the menagerie card backs. Peter's day job was working for Boeing, and he'd arranged to borrow a company lodge on Mt. Ranier for WotC weekend Christmas getaway. Steve & Robin were invited, along with their friends which had been playing Magic with playtest cards in Canada. Steve & Robin took a lot of notes on the ideas and suggestions discussed over the weekend. When they went back home, these notes started being developed into the set that would become Legends. Delta is the name of the card file that was created by Richard after Gamma playtesting was complete. Several final changes were made after Gamma playtesting, but these changes did not get playtested. Some of these changes include using cards that were being playtested for other sets such as Ice Age. Delta was handed over to Wizards of the Coast so that they could create the finished product. As development progressed, Ice Age was selected to be the next Magic product release after Magic: The Gathering. Artwork was commissioned for the set. Jesper had designed the card frames and card back for Magic: The Gathering, and he also designed a new card back for Ice Age. The design for the Ice Age card back was never made public. I've recreated it with Jesper's assistance to give everyone an idea of what it looked like. I want to debut the Ice Age card back image on my YouTube channel, and plan to add it here later. WotC's plan was to print a one year supply of Magic: The Gathering cards that would be collectible and playable. Unfortunately, they could only afford to print a 6 month supply, so the initial release was split into two print runs. Ice Age was planned for a 1994 release, after Magic: The Gathering had sold out. What if Magic: The Gathering players didn't want to buy Ice Age after Magic: The Gathering sold out? If there was still demand for the game after the initial collectible Limited Edition, then an Unlimited Edition would be printed repeatedly until there was no longer enough demand to justify reprinting. These Unlimited cards were expected to be only for players, and not be collectible or have any value due to their larger never ending print run. This business plan was repeatable. Every year there would be a new Magic game released. Any Magic game that was still popular after its initial year, would get an Unlimited Edition printing. This means that if Ice Age were a popular game in 1994, there would have been an Unlimited Ice Age released in 1995 along with the next new Magic release, which was supposed to be Magic: Menagerie. 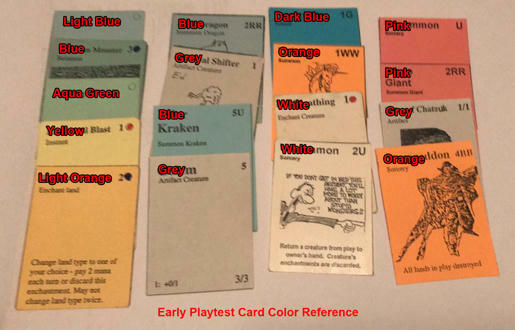 Here is an image that shows the different colors of early playtest cards. Here is an image that shows how some of the colors look different in a scan vs how they appear in a photo. 001 Black Vise should be Gamma (Modified version). 002 Dawn of the Dead can't be Alpha as not yellow, but doesn't have a circle, so can't be Beta ? 008 Fog should be Gamma (Modified version). 011 Gauntlet of Might Beige (Modified version), I'm lost at this one, but must be Beta ? 022 Starburst should be Gamma (Modified version). 023 Sunshine can't be Alpha as not yellow, but doesn't have a circle, so can't be Beta ? Also for Beta "There are at least 3 different colors of cardstock (white, yellow, blue)". I have pics with Beige/Orange and Green as well. Yes, that Black Vise is obviously a Gamma that someone wrote on. This card is a whole different category. It wasn't created by Richard, and isn't really part of his Alpha, Beta, or Gamma sets. This is a card that was created by a playtester (Bit) during playtesting. I do consider it to be a real playtest card, but it's very difficult to know exactly when it was made. It's definitely not Alpha because there was only one deck of cards at that point, and no one else had decks to make additional cards for. From the formatting of the casting cost, it could possibly have been created during Gamma, but it could also be from a different card set that was made later. Yes, that Fog is obviously a Gamma that someone wrote on. Additional note: I see that red letter "T" and green dot on quite a few cards. This card needs more research. It's not Alpha or Gamma. It doesn't look like Beta cards, and probably isn't but I'm reluctant to say without more research. It's probably from one of the sets made after Gamma was made (not after Gamma was completed). 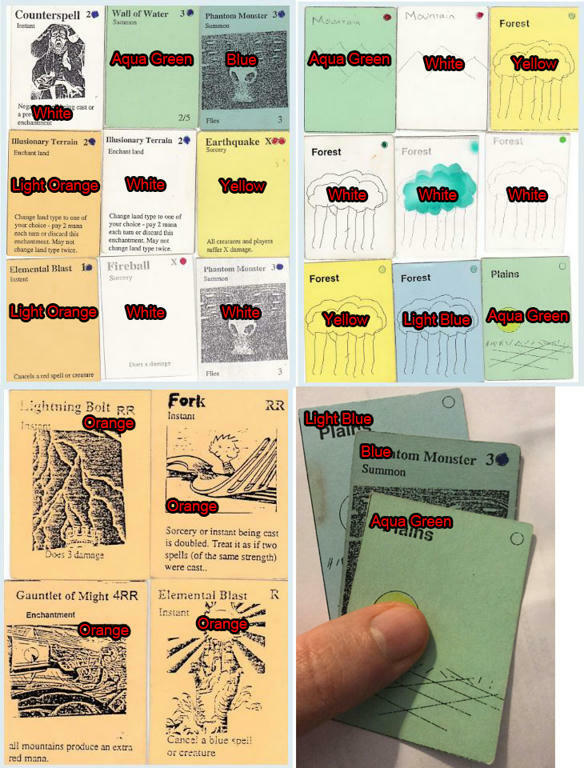 During Gamma playtesting is when playtesters started creating their own card sets such as Ice Age, Menagerie, etc. Richard allowed this because he knew he'd need more card sets in the future. Yes, that Starburst is obviously a Gamma that someone wrote on. It would be interesting to know if this is the card that was written on, or if this is a copy of a card that was written on. Very similar to Dawn of the Dead, discussed above. Yes, that Blaze of Glory is a Gamma that someone wrote on. Yes, that Ice Storm is obviously a Gamma that someone wrote on. Good to know. I wanted to get this basic info written down so that I could move on to more detailed stuff without forgetting anything. The Beige probably needs studied more as mentioned above on the Gauntlet of Might. I know there is an Orange set that came after Gamma. This is probably what you're talking about, but it's possible that Beta could also exist in Orange, so I'd need to see the cards. Green looks a lot like the blue in different lighting. (yellow vs white has the same problem in bad lighting) I'll study the colors more in the future. It's nice to finally get this more sorted out. I am so glad they didn't make playtest boosters. Ok, I did the preliminary color research. I tracked down the owner of that "Beige" Gauntlet of Might, and it's just a bad scan. That card is actually orange (very orange). It's not Beta, it was made after Gamma was made. There are no Beige cards. Beta does exist in Light Orange. There are also two Orange sets that were made after Gamma was made. For some reason, the Orange cards don't scan well. The Orange is very vibrant in person, but on a scanner it's dull and pale. Very strange, as the scanner works fine for other orange things, it's something weird about these cards. I had the same problem scanning that the owner of the Gauntlet of Might had. Here is a side by side comparison image showing most of the different colors of playtest cards in a scan and also in a photo. Maybe this image will help when you're looking at other photos and trying to determine what color a card is in the picture. Beta Green & Beta Blue are the same thing. It's a blue green color, that some people call blue and some people call green, especially in different lighting. It's different from other blue playtest cards. I visited with Keith about what we should do about this situation, and we've decided to call these Beta cards Aqua colored. I'll post a more thorough update soon, including a labeled picture of all the different colors. Well, I do have HQ scans of cards and some are definetely Blue and Green Not Aqua as they were placed on the same scan. All read creature in play +1/1, all mountains produce an extra red mana. Thanks for the pics of the green / blue beta cards. Apparently Keith and I couldn't find one of those when we were searching for colors recently. I think the green one what we were calling Aqua. Looks like we need to find the blue. I'll show him, and we'll look again tomorrow. That Gauntlet of might isn't Light Orange, it's a very vibrant bright Orange. It's the top Orange in the second column in all of the color comparison pics I just added at the top of this topic. For some reason, that Orange color really doesn't scan well at all. It's very bright in person, but difficult to get a good picture of it. Thanks for the pics of the green / blue beta cards. Apparently Keith and I couldn't find one of those when we were searching for colors recently. 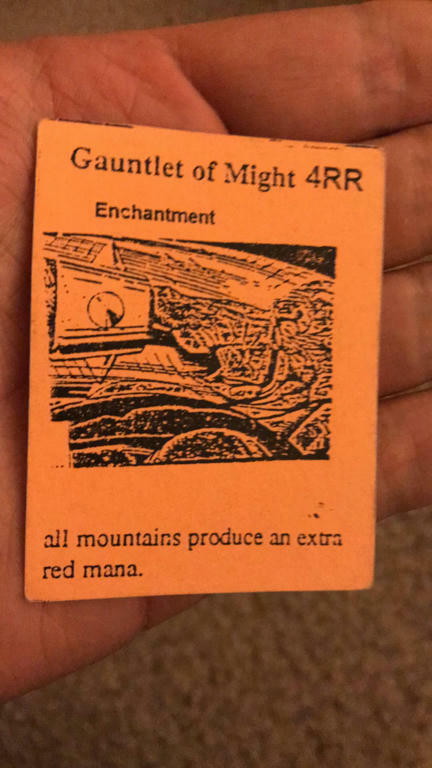 If the pics are coming from Keith, there's not a single pics that he takes of any MTG cards which is not orange and this for so long, so many times I told him to buy a scanner. I agree that his lighting is odd in many of his photos, but that's not the issue here. Some pics are from him and some are from me. I'm a few cards short of having an example of every different type. The "Scan vs. Photo" image is entirely cards that I own, so you can see the difference without Keith's lighting. I have Orange cards here, so I can assure you from personal experience that they are a bright vibrant color, and for some reason the color looks bad in photos and terrible in scans. Keith having a scanner wouldn't help for the Orange cards because they don't scan well. There's a bunch of scans of cards that I need for the website to complete subsections, he owns a bunch of them, but that's years that I'm waiting for his scans. Thanks for clarification, I didn't see the scan vs photo pic, what a mess. Now, out of the scans I own I can see the difference between (Green even pale green), blue, and what you call aqua. OK, Keith and I double checked colors today. Yes, there are blue beta cards, two different shades of blue in addition to the aqua color. He doesn't have many of these blue ones, which is why we missed them the first time. He provided a new photo with every type shown, which I've labeled and uploaded here in this article, replacing yesterday's image. I've left my Scan vs. Photo image the same for now, but I might update it in the future if I acquire more of the different color types. I've updated the beta description to include the 6 different colors of Beta card. Blue: Not sure which one is this. Aqua Green: Example from the pic I've posted above: Phantom Monster, Mountain Handwritten name in the Tab Others. Pale Green (Verveine Color): Example from the pic I've posted above: Mountain, Plains, Wall of Water etc. Light Orange: Elemental Blast, Gauntlet of Might, Fork, Lightning Bolt, etc. White: Example from the pic I've posted above: Fireball, Forest, Mountain, etc. I have more pics or scans of blue cards if needed as well as others (need to dig). The Orange cards scan terribly. The bright scanner light overexposes them so the color looks washed out. Have a look at this card. What color would you say this card is? If this card is by itself like in this photo, many people would say that this card is blue. If you don't have other cards in hand to compare with, this color will be difficult to identify.